Yes, CBD products are legal to consume and to distribute across all 50 states. 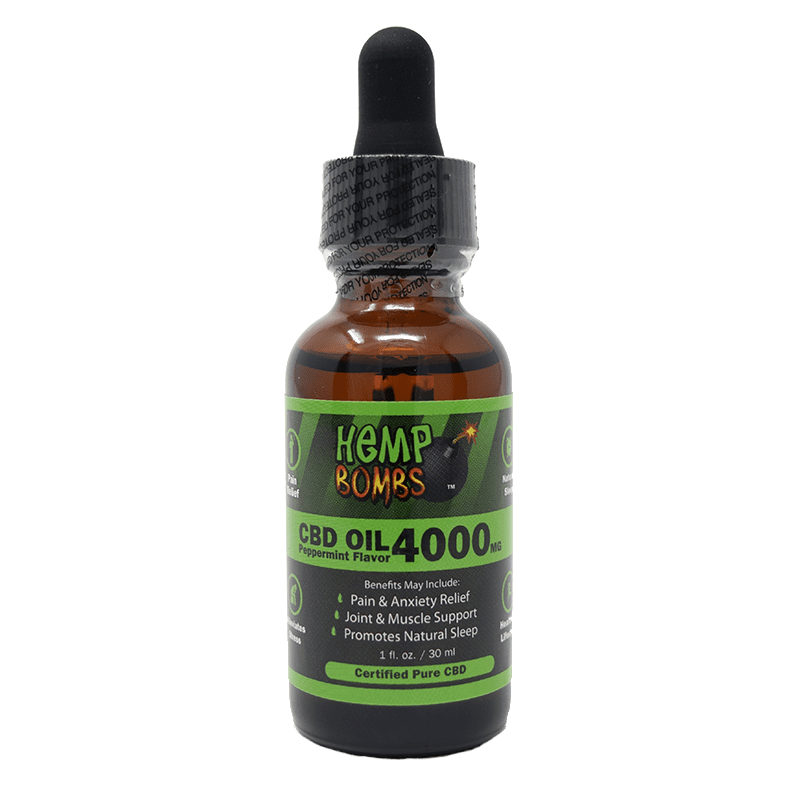 In compliance with the Federal Farm Bill, Hemp Bombs CBD products are manufactured from the “legal” parts of Industrial Hemp, including the plant’s stalks. 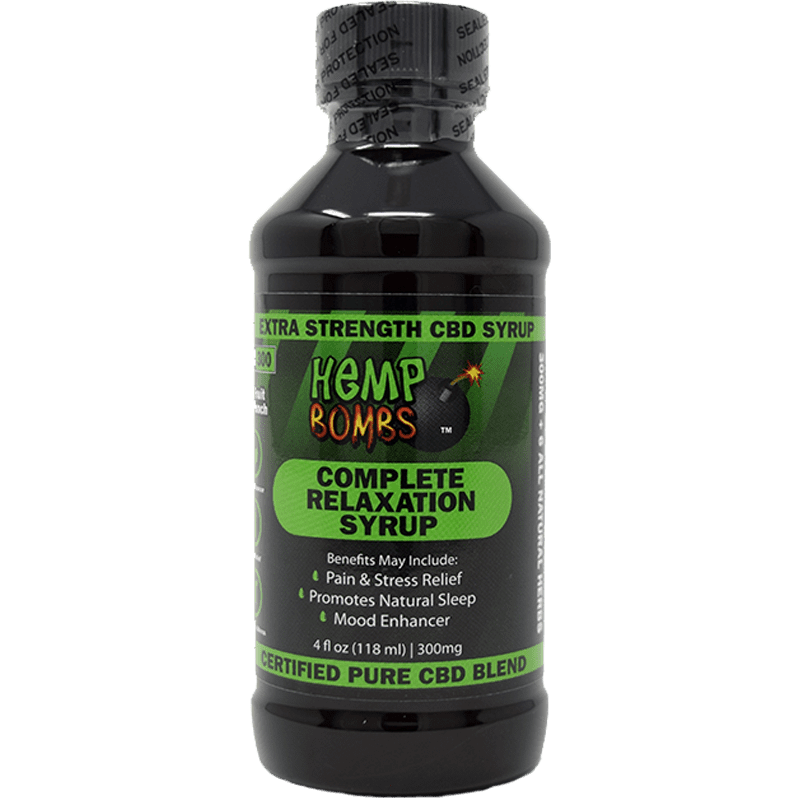 Upon independent third party testing, Hemp Bombs’ CBD Edibles products have a 0% THC count. The cbd capsules really did it for me. And I like the gummies too. I want to try your vape soon. Love this bundle will definitely order it again! I do sleep better using the syrup and the gummies really relax me. I haven’t opened the oil yet, I’ve used other brands so I have something to compare with. Thank you! My sciatica pain has eased off alot. The CBD Oil was fantastic! I will reorder that. Ordered this package for my husband for Christmas. He’s going to love it. He loves you guy’s products. The CBD oil in this bundle really knocked my socks off. I just reordered the Peppermint flavor in the 1000mg size. the syrup is my favorite since i suffer from anxiety and it prevents me from getting a good nights rest, so happy i came across this brand. received my bundle bout a week ago, so glad I bought this first. I love the syrup it puts me right to sleep. 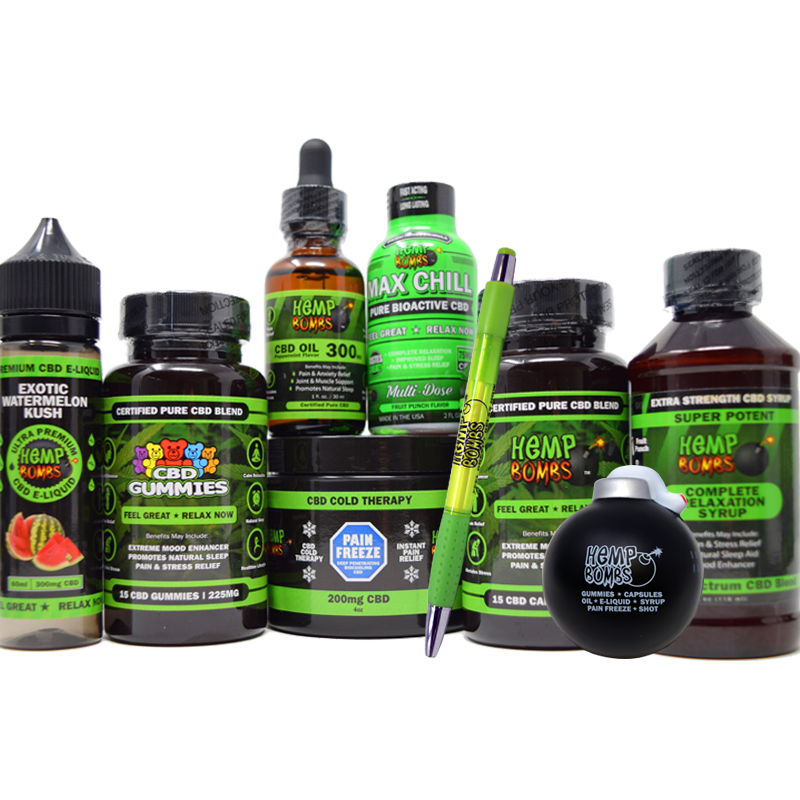 Think I’m going to stick to buying the gummies but the cbd oil did surprise me and is really easy to use. Wish the syrup had a different flavor, great products nonetheless. I kinda wish they included the e liquids in this bundle. They’re really good and have the same effect for me that the rest of the products do. 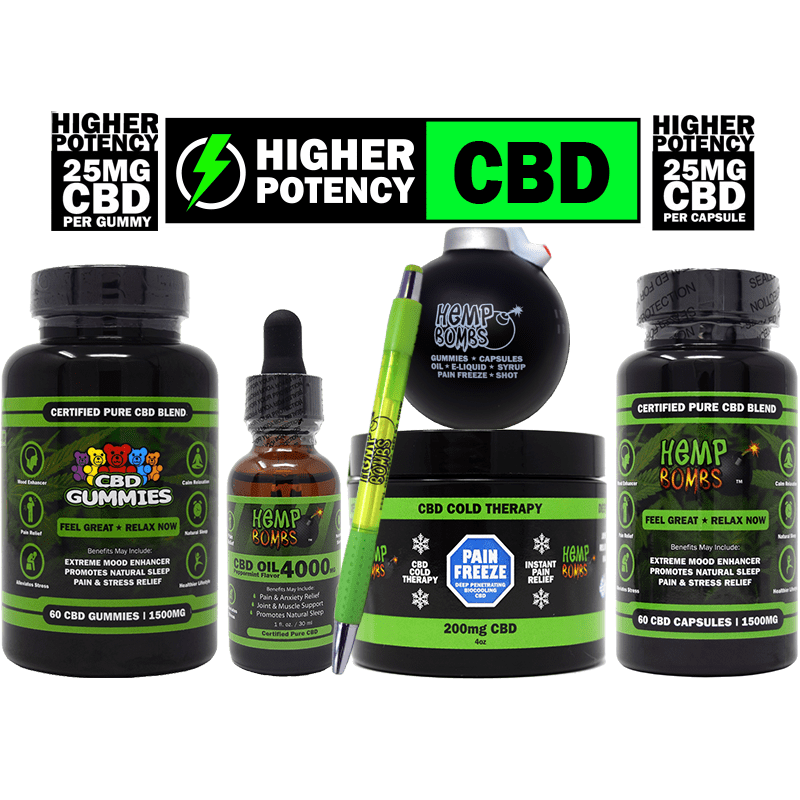 My next order will be for the high potency cbd capsules. The capsules make me feel very relaxed and mellow. Your CBD Syrup makes me sleep deep. And the Oil relives my anxiety issues. It was a good purchase. Really liked the oil in this package. And loved the Hemp Bombs stress ball. Cool. This is a good value. Not a vaper. I really love the gummies. this is the “bomb” (haha) for me! I will always buy this exact thing. it has everything that i like and want and need in one place. I swear by the cbd oil. I’ve been taking it every night since i received the bundle and have never slept more deep. It also helps me relax an the afternoon on weekends. 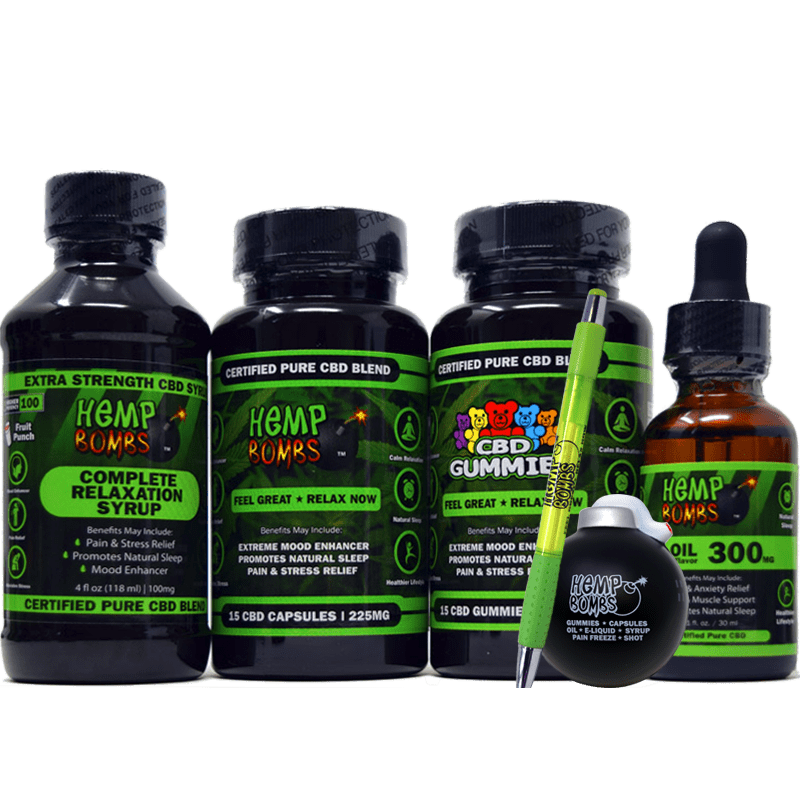 I finished everything in the cbd bundle and just placed an order for high potency gummies and high potency capsules. Wife likes the gummies and I like the capsules. This was a great purchase. Since I don’t smoke, I didn’t need any vape products and I liked all 4 of the items. 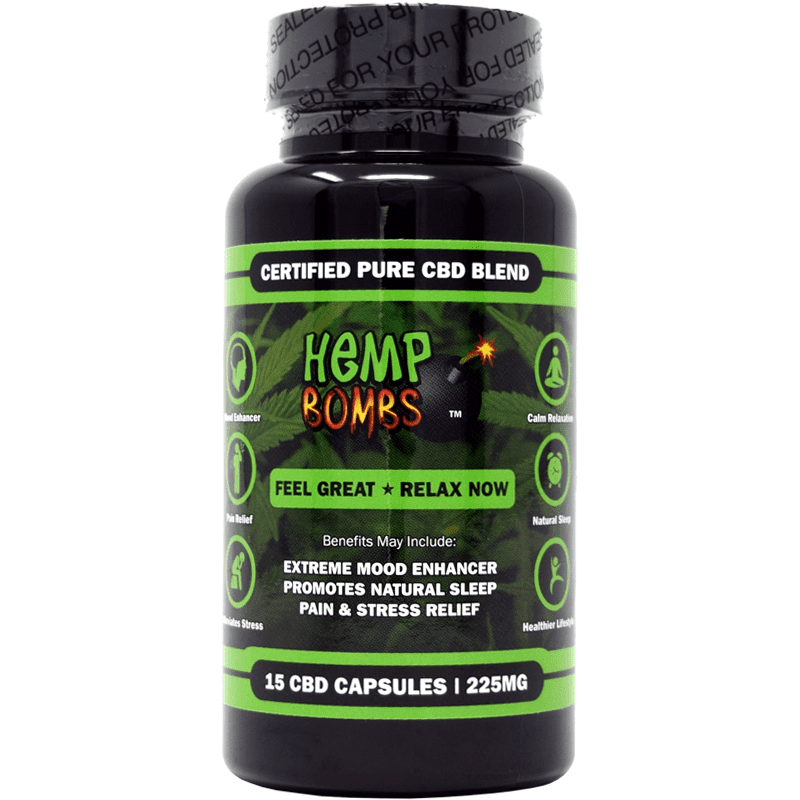 really liked the effectiveness of the cbd oil and cbd capsules. I’ll be making more purchases. My package arrived in only 4 days. Thank you very much. i wanted to try your stuff, but didnt know what i wanted or would like. A person who answered the phone there steered me to the edible pckg cause i dont smoke and all the things in this package are things that I might like. I am so glad I went this route because I know now that I am definitely a gummie and oil fan. Didnt care for the capsules and the syrup just dont last long. Im so glad i called your company instead of trying to figure it out on my own. Hey, just a quick note on my experience. The CBD Oil in this package is the best I’ve ever tried. Absolutely winner product. I wanted to let you know that I really appreciate the fact that you have a bundle that I could use. I never smoked and I never vape, so the edible bundle was perfect for me. And I love everything in there. My mom swears by these products! I’m so glad I was able to find you guys and help my ailing mother. Just got my bundle last week, started using it andddddd it’s awesome! Lovely products, only suggestion would be to double the quantity and price for those who want more! a week after ordering this package, my tracking number was showing that my product hadn’t moved at all so i called hempbombs customer service and the lady told me she would get another kit out to me right away and include an extra freebie for the inconvenience. rock on!! I love these products and this company.thanks guys. I can finally sleep a full night thanks to these gummies! Hey you guys i needed to pop in and let you know just how amazing your products are. i deal with chronic pain as well as an inoperable tumor within my braib on my pituitary gland complicating my seizure disorder. Your product is the only one that has interupted seizure cycles as well as vomiting cycles. I cant wait to get my hands on on the tincture and muscle rubs. Have you guys thought about bath bomb type stuffs? Ive used several caps, opened them and let them disolve into a hot bath, and wow! It relieves and helps heal skin issues like dermatitis that hasnt responded to anything. If I take two internally before the bath, im able to get out a full meal and get a total night sleep in. Being hungry for me is almost impossible since multiple organ failure in 2005, including my liver. Not only does it help me get hungry it helps me retain the food so im able to put weight on! Im up 5 lbs!!! My last order i grabbed a syrup and vape juice on top of my own for my good friends who just went through losing a parent, with how calm it keeps your core I knew they could use it. Of course they loved it. It helped coping during some heavy emotion, which with us seizure patients can and will trigger activity. I can say they made it through without incidence. Thank you guys so so much. Thank you for the quick shipping. Dug into the gummy bears first and loved those. That’s all I tried so far. We went through the gummies pretty fast. Then we found the capsules worked even better. And the syrup and oil was good too. Very happy with your Hemp Bombs bundle. Especially the gummies! We have been very happy with all your products and customer service. No problems. I LOVE EVERYTHING ABOUT THE OIL. IT SMELLS GREAT AND HAS A HIGH CONCENTRATION OF CBD. AWESOME. FYI, we ordered the premium sample package and got the edible bundle. Customer service had already sent the premium (correct) order right behind the first order and i got it the next day. Impressive customer service! I just opened the box and tried the gummies right away. They’re really easy to eat and have a good flavor. I purchased some of your hemp oil a few months back and it did wonders for relieving my arthritis in my wrists. Saw your new Edibles bunch and pulled the trigger. Turns out all the products work well with a similar affect. Big thank yous from Idaho. 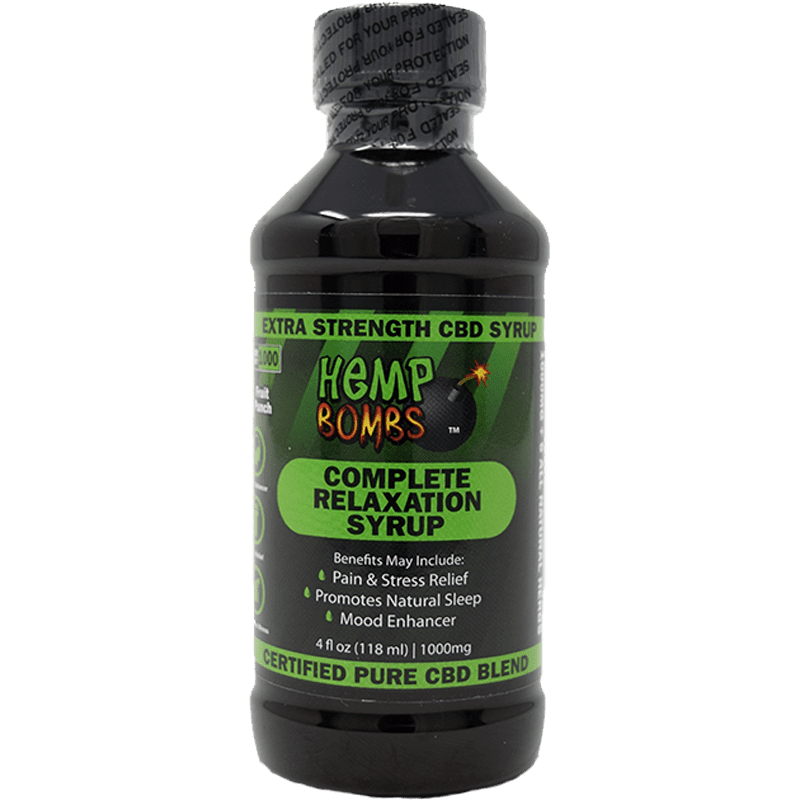 seriously potent CBD oil. knocks me out. Do your homework. I highly recommend the CBD oil as well as all the Hemp Bomb products. These guys really know what they’re doing. Just thought I’d let you know what a wonderful experience I had with your cbd capsules. I tried many other brands before I came across your Hemp Bombs site. I read all the reviews and was impressed by what I learned. Started taking the capsules and found that it really relaxes me and reduces my anxiety. I am now using it exclusively and feel good about it. Not to mention I am saving money when compared to my prescribed pain medicine. These are all sooooooooo good. Thank you for helping me complete my order over the phone. My credit card failed and a nice Hemp Bombs lady in customer service called me and we got it done. Can’t wait to try all the products. Great package! Has everything I already use. Just ordered your edibles cbd bundle. I already eat your cbd gummies like candy and this looks like a good value. Been wanting to try your oil anyway. A family member recommended your CBD oil to me and I’m so grateful. I’ve been taking it now for 3 months now and it has improved my hair and skin. I just use a drop a day under my tongue. Hemp Bombs oil is the best. I highly recommend it. I can’t tell you how much the syrup helps me sleep. It’s like my eyes can’t stay open very long after taking it. Is there other flavors to try?